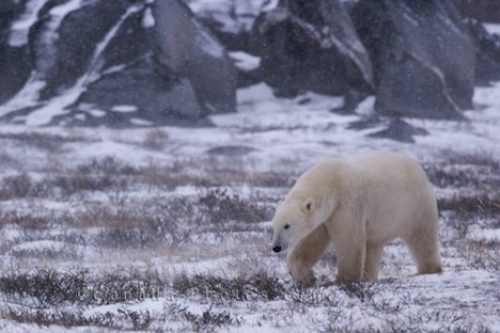 The snow has finally begun to cover the barren tundra along the shores of the Hudson Bay in Churchill, Manitoba which is what this Polar Bear has been waiting for. As the colder temperatures bring in the ice and snow, the polar bear will then stop foraging along the shores of the Hudson Bay and hunt down its favorite meal of Ringed Seal. A Polar Bear has an incredible sense of smell and the smallest scent of Ringed Seal within a range of about 20 miles, will be picked up by these animals. While following the scent, he may get lucky before the shores of the Hudson Bay freeze over and find a good meal or he will scour the shores for tidbits, enough to hold him over until the Ringed Seals are easy to reach. Picture of a Polar Bear walking along the tundra near the shores of the Hudson Bay in Churchill, Manitoba as the snow falls. The beginning of winter is when the Polar Bear is the hungriest as they have been resting and conserving energy awaiting the months ahead when they can reach the seals. Over the years, global warming has depleted the Polar Bear's habitat as the Arctic Sea ice appears to be melting faster which could eventually cause the Polar Bears to become extinct. Being the largest predator in the world, the only ones who can help the survival of the Polar Bear is humans as we are the ones who have caused the threat of global warming on these marine mammals.